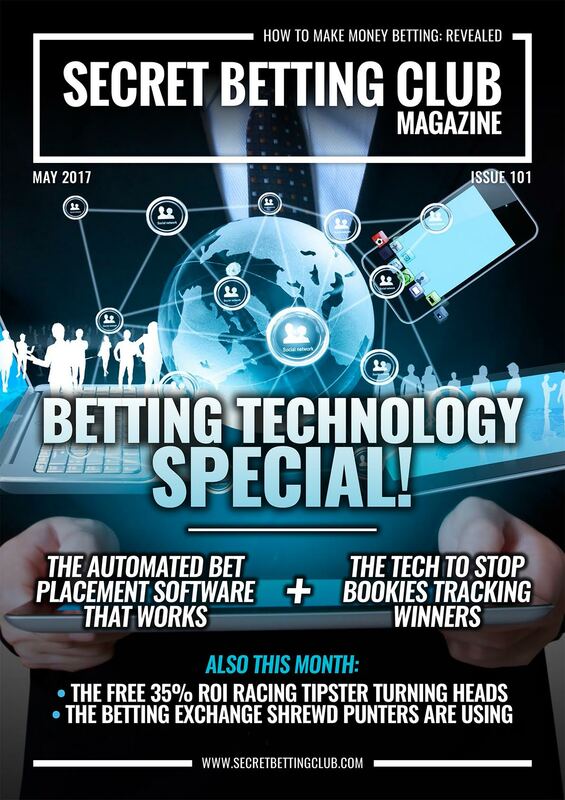 The very latest SBC Magazine (Issue 101) is a ‘Betting Technology Special’, featuring reviews of 2 very impressive software solutions for shrewd punters. If you are interested in covering your tracks as a winning punter or the idea of automatic bet placement software (for use with and without tipsters) – then its a must-read magazine. Sign-up now to gain instant access to SBC 100 (and the entire SBC back catalogue) or read on for more details. The Automated Bet Placement Software That WORKS! Sit back and let this bot do the work for you with automated tipster profits. Avoid bookie spyware & open new betting accounts without issue with this impressive software. Discover the hot FREE racing tipster firing in winners left, right and centre. The racing focused exchange that shrewd punters are now using instead of Betfair. Make sure you grab your copy of SBC 101 right away to take advantage of some extra special deals and discounts available now. For those of you interested in the automated bet placement software you can gain an extra 18 Euros credit if using it plus details on a 20% bonus membership offer for some of the best tipster services it works with (valid until the 29th May only). The technology to help stop bookies tracking you as a winner is also offering a free upgrade to their Pro service until the 22nd May only. All of these offers are available to SBC members and form part of the special deals, trials and discounts we negotiate on your behalf. You can access your own copy of SBC 101 and our entire back catalogue of magazines the instant you join the Smart Betting Club. By joining today, you can also save up to a whopping £38 on the usual cost of an SBC membership. This is because we have slashed the price of joining to ensure as many of you as possible have access to our fantastic magazines and reports. This entry was posted in SBC Magazine and tagged betting software, betting technology, free racing tipster, SBC 101, tipster software. Bookmark the permalink.